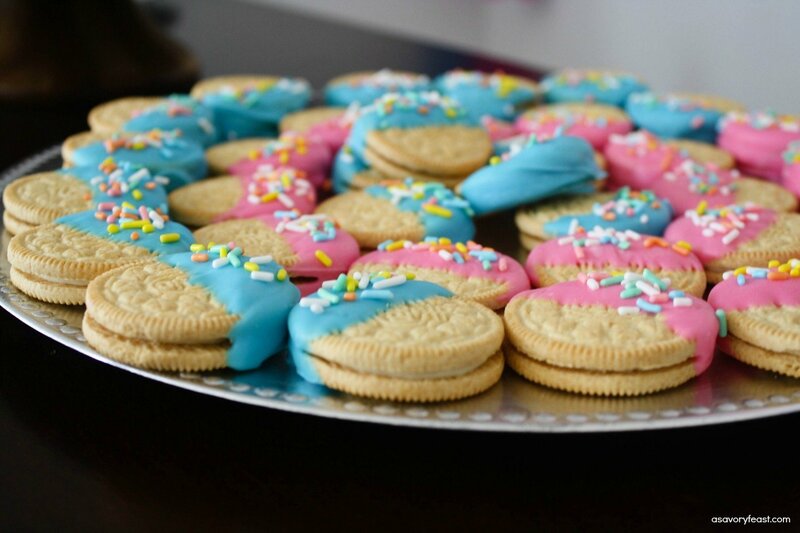 Planning a gender reveal party? 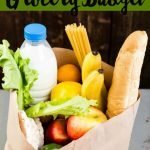 Here are some simple yet super cute ideas for food, decor and how to do the big reveal! 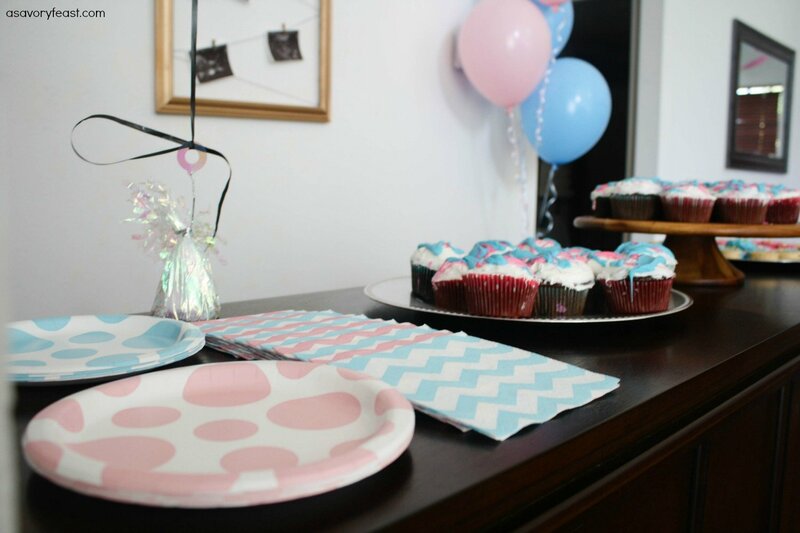 I’ve been itching to share the details of our gender reveal party with you! We had been trying to decide whether or not to have a party ever since we found out we were pregnant. In the end, we decided that it would be so much fun to let our family and a few close friends find out with us! Parties with our families are never small, since Andrew has 5 siblings and 6 nieces and nephews. To keep the party low-key and stick to a budget, we had the party at 2 PM on a Sunday and just served snacks and desserts rather than a full meal. I went with a simple pink and blue theme for the party. I picked up some plates, napkins, streamers and balloons to decorate the house with. 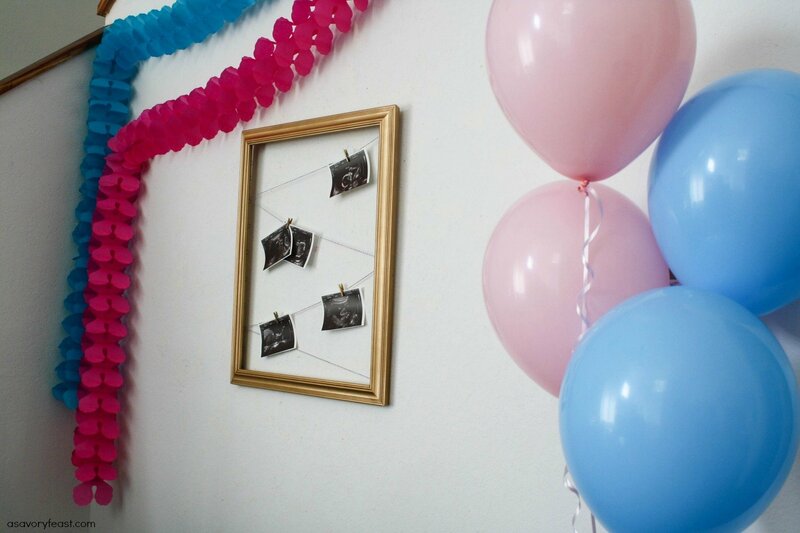 If you are looking for actual gender reveal decorations, I did see some online but didn’t have time to order them. We really wanted to keep the big reveal a complete secret so that our family and friends could see our reaction to finding out if we were having a girl or a boy. 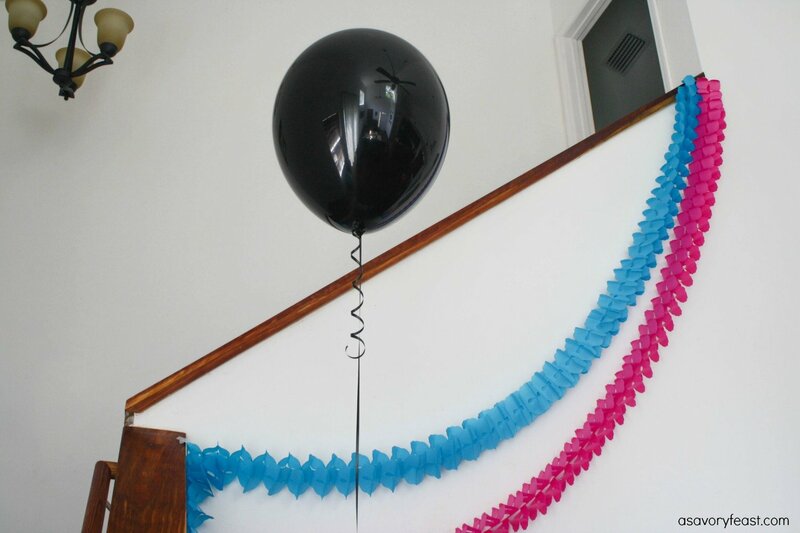 After searching through a bunch of Pinterest ideas, I decided to go with a confetti balloon reveal. Many party stores will fill the balloon for you without letting the secret slip out! I just brought the envelope from the ultrasound with me when I placed my order. To make sure that the color would be visible in photos, I had them add tissue paper strips in addition to the confetti. It worked great! The main focal point of my party was the dessert bar, which was the first thing guests saw when they walked in. 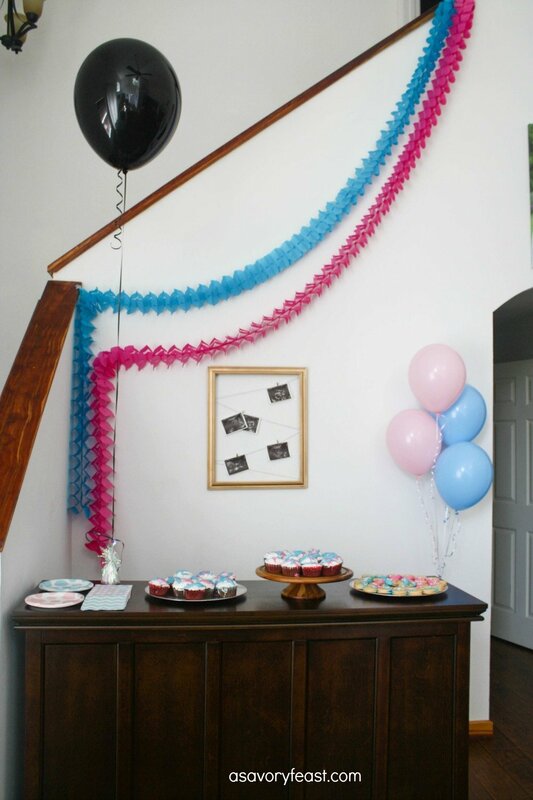 I decorated with pink and blue streamers and balloons. Be sure to add your ultrasound photos to the decor! Your guests will definitely want to take a look at them during the party. 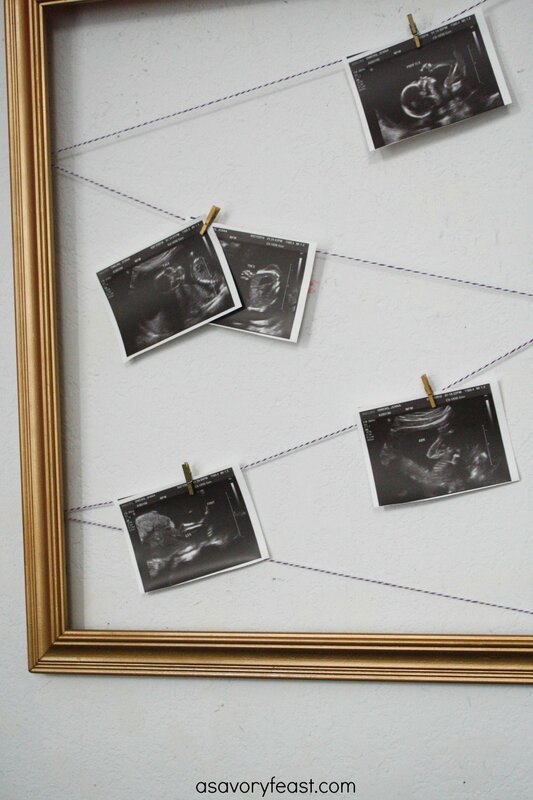 I made this cute display for the ultrasound photos in minutes! I had this big frame that was spray painted gold from our wedding decorations. I used bakers twine and stapled it to the back of the frame in a zigzag pattern. I got the recipe for these Confetti Oreos from Sprinkles for Breakfast. 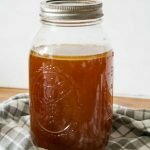 They were so much fun to make and a hit with my guests (especially the kids!). For the melting chocolate I used Wilton’s Candy Melts in Bright Pink and Blue. I also baked cupcakes and frosted them with white frosting. Then, I drizzled more of the candy melts on top. In addition to the desserts, we also served some salty snacks like chips and dip and chex mix. We also set up a drink area with sodas, water and wine. 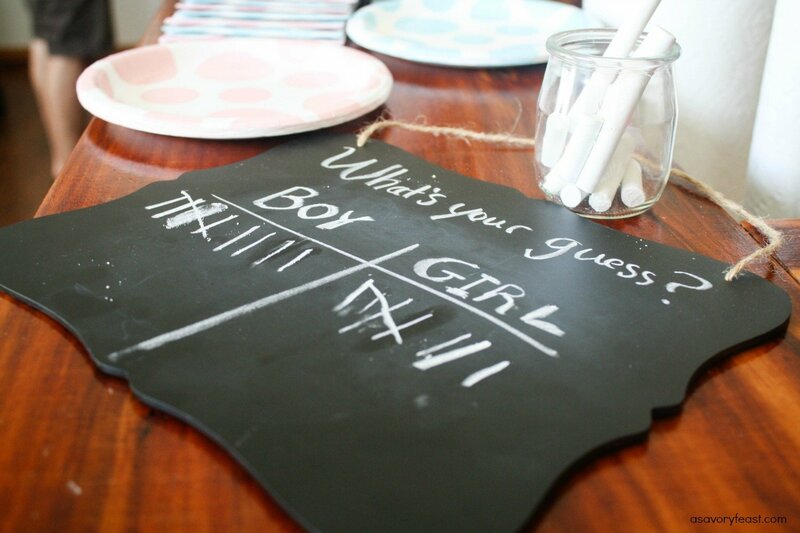 I used a chalkboard to have my guests vote for whether they thought the baby would be a boy or a girl. We also asked guests to wear pink or blue for their prediction and took some fun photos of each team before we popped the balloon. 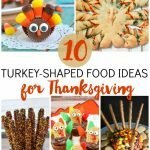 Love these party ideas? Be sure to pin the image below! 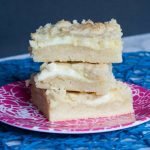 And don’t forget to subscribe to A Savory Feast’s weekly newsletter to stay in the loop with delicious recipes, party ideas and kitchen tips and tricks. 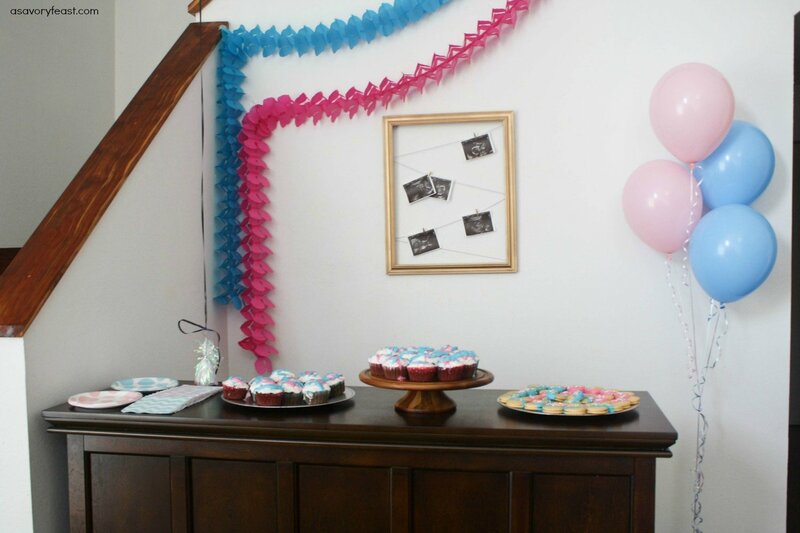 Did you throw a gender reveal party when you were pregnant? How did you do the big reveal? very cool party I love all of the decorations and the oreos were a great idea. I never had a reveal party for my two. It is a fun idea though. We had so much fun with this reveal! It was a great way to bring our family and friends together and celebrate the new baby. Oh this is so cute!!! I love it!!! Ahhhh!!! Sending to all my pregnant friends! hehe! Congrats! I love having my sweet boy, he definitely loves mommy so much. What a great party! Thanks Kati! We are super excited to be having a baby boy. So much fun! The video was awesome. You will love that little boy like crazy! Haha thank you! At first I wasn’t sure if I’d want to find out in front of everyone either, but we decided to go for it. It turned out to be so much fun and of course capturing Andrew’s reaction was priceless! That is so cute, congratulations!!!! This is so cute. You’re husbands reaction was great. Congratulations. Thank you! This party was a lot of fun and I’m so glad we captured his reaction on camera. Aww thank you so much! I’m glad you enjoyed the post and the video. YAY! I love that you shared the video with us. It is so sweet. I can tell your husband is just over the moon excited for a boy! Congratulations, friend! Can you tell he was reallllyyyy hoping for a boy? Hahaha we are both super excited! Thanks, Laura. What a sweet way to celebrate! Thanks for sharing on the #BloggersGetSocial Get It Together link party! Thanks Krystal! Have a great week. I had the hardest time just waiting until 18 weeks to find out! Maybe with a future pregnancy I’ll wait and go the surprise route. But it’s so fun to be able to buy pink or blue and decorate the nursery! Aww that is a really fun idea for a reveal! That is one I had never heard of before. 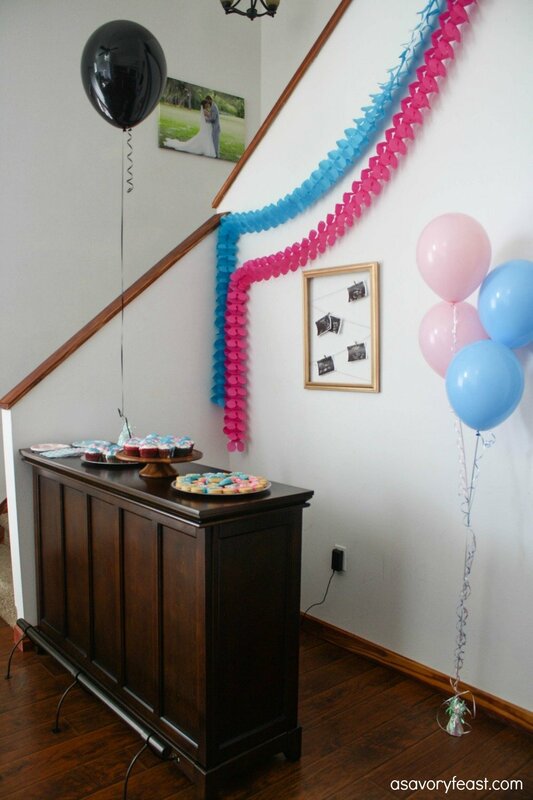 This is so cute- from your blue and pink outfit to the decorations. Your husband is so excited- congratulations!! Aww thank you! I had a feeling it was a boy but had to wear a little pink — just in case! Awwwww, so fun!!! Congrats friend! Thanks Kristi! We had so much fun with this party. 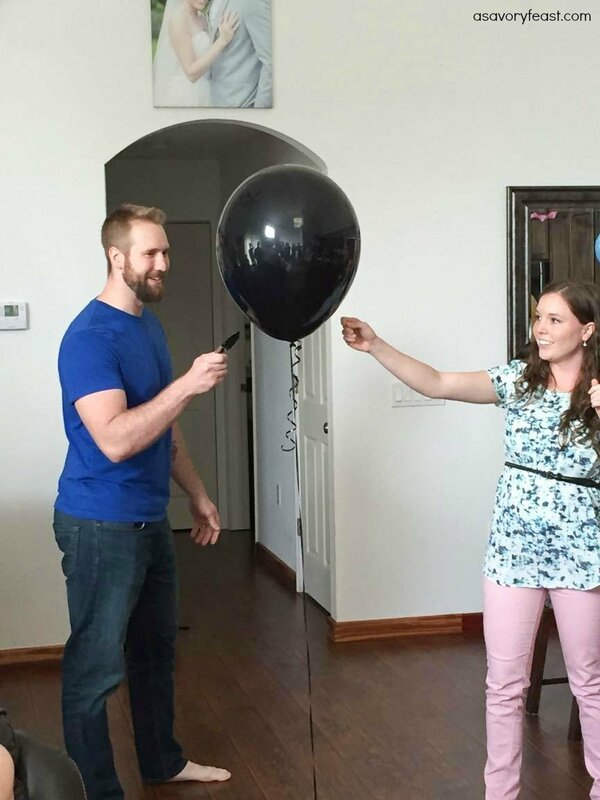 It was such a fun way to find out the gender with our friends and family there. We are super excited to be having a boy!